A decade ago, the outlook was bleak for renowned Altona book printer, Friesens Corporation. The first e-reader was marketed by Amazon in 2007, the global economy tanked in 2008 and China emerged as a cheap competitor in book printing, sending business offshore. “We had this digital threat, foreign threat and economic threat, all three of those had a tremendous impact on publishing and on Friesens,” said Chad Friesen, who was appointed CEO last October. But the march of ebooks hasn’t wiped out paper, as many predicted. In fact, ebook sales in North America plateaued the past two years at about 20 per cent of the market, and even dipped slightly last year. Meantime, hardcover books — Friesens’ stock in trade — went on a little surge. They have climbed seven per cent in each of the past two years in North America. Friesens is a privately owned company and the CEO wouldn’t divulge its sales figures except to say its gains were comparable. While it may be too early to run the “Paper wins! Paper wins!” headlines, no one was predicting this. To meet rising demand, Friesens has gone on a hiring spree. A total of 36 employees were hired from the Philippines last year, and another 40 are in the pipeline and expected to arrive soon. 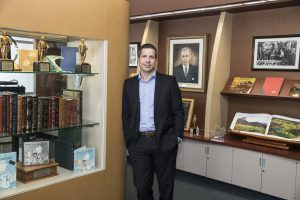 As well, the company has reinvested $7 million into two top-end bookbinding lines, the kind of shopping spree the company wouldn’t have made five years ago, Friesen said. But there were tough times. Many book printers and bookbinders left the sector between 2008-12. “There was a kind of hollowing out of the book-printing market,” Friesen said. At Friesens, the private company staved off layoffs in part because it’s employee-owned. “Employee-owners made some concessions on compensation,” including a pay cut, Friesen said. Key to the turnaround, Friesen said, was the corporation maintained its sales force. When the economy started to recover it positioned Friesens more quickly in the market than companies that cut sales staff. The company also started two new product lines. In 2009, it entered self-publishing services, where it helps people publish their own work. The same year it started a specialized packaging company, think4D. Think4D is a plastic packaging company using patented thermoforming technology. Friesens purchased the technology from the developer and holds the patent until 2025. “It’s still print. We come from a print space so we were able to apply some of those capabilities to packaging,” Friesen said. It meant repurposing some employees, but Friesens today has virtually the same number of employees, 570, as back in 2007. “It hasn’t been that we’ve just held the same people that we had in 2007 and they are in the same types of roles. There’s been a dramatic change in roles,” Friesen said. The two new businesses combined make up more than 10 per cent of the company’s gross sales today. CEO Friesen is no relation to the founding family of that name. David Friesen, the last of the founding family members connected to the company, sits on the company’s board. The new employees are largely coming from overseas, as Friesens accesses the provincial nominee program. That’s a surprise. Friesens is one of the top, if not the top-paying employer, in southern Manitoba. Its wages have to stay competitive with unionized printers in Winnipeg. However, it already has about 570 employees in Altona, which has a population 4,167, according to the 2016 census. “We have a very difficult time just finding enough people. We’re running 24/6 — four full-time shifts,” Friesen said. Employees work two 12-hour shifts one week, followed by four 12-hour shifts the following week. The company started foreign recruitment about three years ago, and the first arrivals included people from Syria, Venezuela and China. Lately, it has focused its efforts on the Philippines. Ron Funk, the vice-chair of Morden Chamber of Commerce, said most major companies are having to access the provincial nominee program for employees in the Pembina Valley. “Everybody’s suffering from the same thing. They desperately need workers,” Funk said. Foreign workers can arrive within weeks or months after recruitment, and receive the same compensation as any other employee. However, it costs the company extra for recruitment. Those costs include travelling overseas to recruit workers, reimbursing the new arrivals their airfare and assisting them to get settled. They receive funds from the Canada-Manitoba Job Grant to help pay for training initiatives like English language or essential skills training, but 55 per cent of the costs are still borne by the company and the classroom is on the company site, Friesen said.